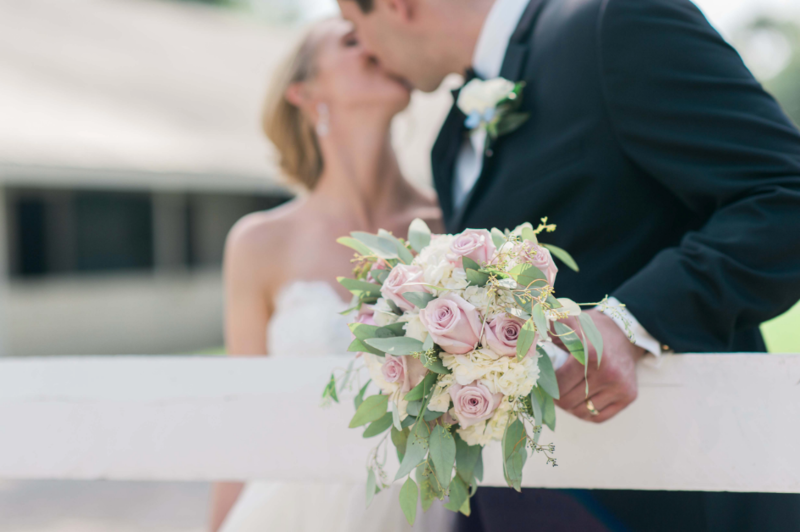 Abby and Nick's Keeneland wedding was simple and elegant with a fairytale atmosphere, highlighted by light creams and whites, soft pink and a Cinderella blue. Lexington was a perfect central location for both our families. I also grew up around horse racing my whole life and we both enjoy the races so much! Keeneland is so beautiful and was the perfect fit for our wedding day! The couple chose an elegant menu to match their elegant venue. Guests were treated to Corn Cake and Pimento Cheese Sliders, Brie and Fig Crostini and Pretzel Spoons with Short Rib BBQ for hor d'oeuvres. Both the bride and groom love crab cakes, so they worked with the Keeneland team to develop a main course that consisted of Caprese salad, New York Strips, Crab Cakes and Au Gratin Potatoes. We chose Keeneland because we both had a lot of family coming from out of town. Lexington was a perfect central location for both our families. I grew up around horse racing my whole life and we both enjoy the races so much! Keeneland is so beautiful and was the perfect fit for our wedding day! What were some of your favorite details from your special day? "Our favorite wedding detail was the antique doors that displayed our seating chart. My parents live in a historic home and we found these beautiful old antique doors in the attic covered in dust. Once we cleaned them up they were beautiful! We decided to hang our seating chart from them so our guests could easily find their seats for dinner at the Keeneland Entertainment Center." "My advice would be to enjoy the process of planning and preparing for marriage because it can get overwhelming and become stressful at times but this is the one time you will do this in life so enjoy every moment! Another piece of advice we have is to enjoy every single moment because time goes by so quickly on your wedding day."